If you're anything like me, your heart does an extra pitter patter for beautifully wrapped gifts. Crisp folds, clear tape, beautiful bows, and coordinating colors. It's a special kind of beautiful. I know I'm not alone! I've decided to post a few wrapping ideas that may strike your fancy. My faves are the ones that incorporate actual hair clips because, BAM, instant second gift! This is just a simple, tall box that was wrapped in brown craft paper. Craft paper is cheap and provides a blank canvas for your gifts. 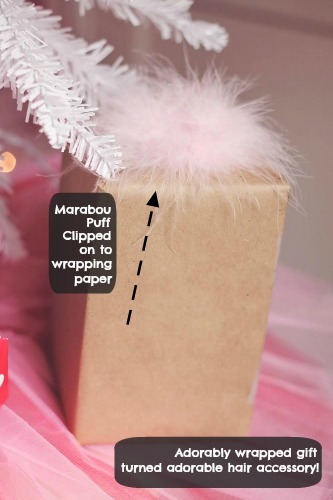 The end folds of the paper made a great slot for me to clip a fun light pink marabou puff. After the recipient opens this gift, they get to keep the clip as an added bonus! This one actually may be my favorite. This is perfect for a woman. Again, I used brown craft paper because I love the simplicity. 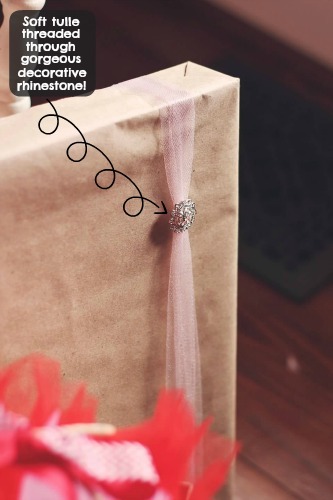 I threaded one of our vintage decorative rhinestones onto a single strand of tulle and wrapped it around the package, securing it on the back. Of course the rhinestone can be saved for crafting purposes, but it's a beautiful gift even if the recipient isn't a crafter! The snowman clippie makes this perfect for a little kid! 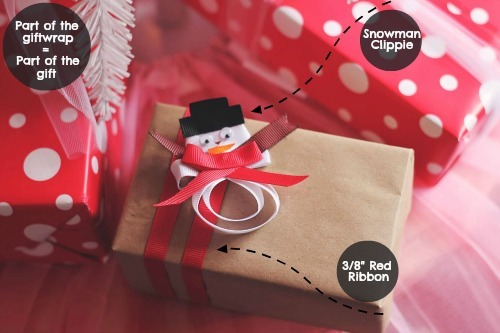 I wrapped two strands of 3/8" grosgrain ribbon around one end of the gift and then clipped the friendly little snowman onto one of the pieces of ribbon. So festive! A few random ideas for you. The top portion of the photo shows gift bags (because let's be honest... sometimes we are a bit lazy!) that are stuffed with a tutu. What little girl wouldn't love this? Put their gift in the bag and then stuff a $4 tutu in the bag upside down. Obviously that is more expensive than using plain tissue paper, but it's much more exciting too! And it won't end up in the trash bag, which is a huge win! 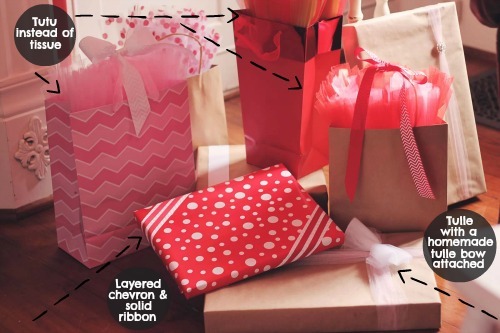 The bottom left gift features a few strands of grosgrain ribbon. I first wrapped a 1.5" white chevron ribbon around the edges and secured it with tape. Then I used 3/8" red ribbon and did two different strands on top of the white. Together, these gifts look fabulous under the tree. 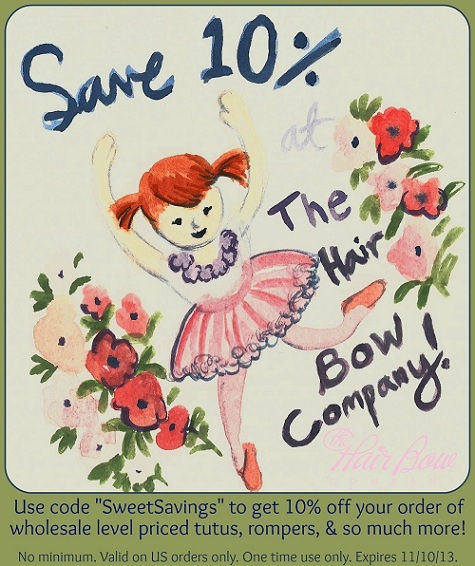 I love that you can choose colors and styles that fit each recipient's style, so you know they are going to love it! For links to each of the items I used, see below.